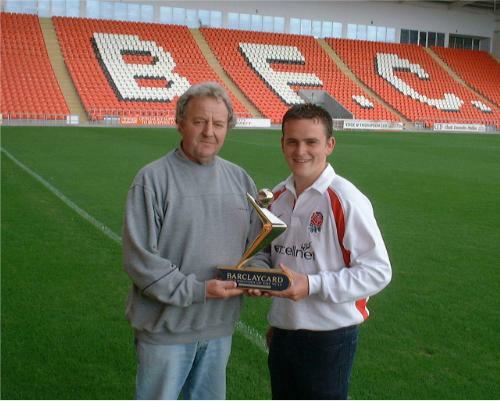 Posted on: Wed 17 Nov 2004 Tweet Congratulations go to Blackpool fan Paul Burgess who has been crowned Groundsman of the Year 2002 for his work at Arsenal FC. Paul began at Bloomfield Road on Work Experience helping out John Turner and Keith Wadeson but has progressed quickly through the ranks to Head Groundsman at Highbury. He is a keen Pool fan and trys to watch the team whenever and wherever he can as well as taking in the Gunners. Paul is pictured below with his Trophy at Bloomfield , pictured along side John Turner.